Miss Universe 2017 Demi-Leigh Nel-Peters and Tim Tebow of ESPN attend the Party At The Playoff at The GlassHouse on January 5, 2019 in San Jose, California. The couple just announced their engagement. Remember the Tim Tebow craze a few years back when the former NFL player caused a national phenomenon by taking a knee during games and "Tebowing?" Well, the current ESPN sports analyst just took another knee... and popped the question. 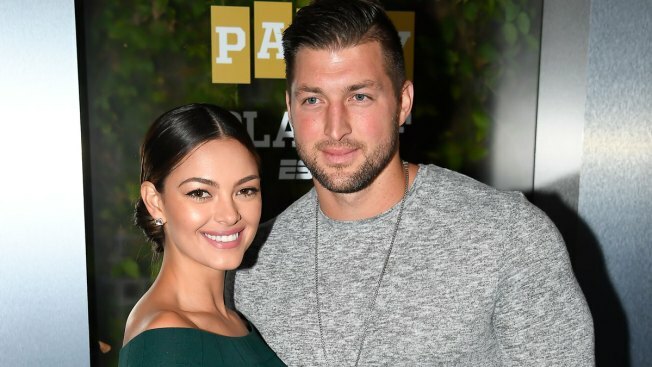 Tebow, the collegiate football star who had NFL stops with the Denver Broncos and New York Jets, revealed he proposed to girlfriend and 2017 Miss Universe winner Demi-Leigh Nel-Peters. "Thank you for saying YES and making me the happiest man in the world," Tebow captioned a photo on Instagram showing him taking a knee during the proposal. According to People, Tebow popped the question during a Wednesday sunset at his family’s farm outside of Jacksonville, Florida.